Superior Basement Systems would like to take you through the steps of our service to show you how we really stand out as the best basement and crawl space waterproofing contractors in the industry. From the first call, we're dedicated to providing you with the best products, practices, and results anywhere in the industry. Since 1991, Superior Basement Systems has been dedicated to giving you the best service right from your first call. When you contact us for a free basement or crawl space waterproofing quote, you can count on a trained and friendly representative to answer right away- without you having to navigate through an inconvenient automated system. From here, we'll set up with an appointment for an on-site inspection and send you a full-color 88-page book on basement waterproofing or on crawl space moisture control. These books provide a powerful research tool, covering everything you need to know about drying basements and crawl spaces while showing you why the Basement Systems line of products, provided by Superior Basement Systems, works best. If you're not available during a weekday to meet with a specialist, many of our field experts have also made themselves available during nights and weekends. We want to schedule our visit when you can be available, and we'll do our best to work with you. 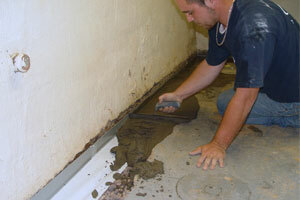 Basement waterproofing is something you want to do once and correctly. The system design specialist should spend at least 90 minutes helping you to consider the best options available to permanently turn your wet, dank basement into dry, usable space. What can you expect from your field representative? 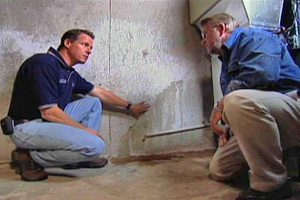 A knowledgeable, skilled, and well-trained expert in the field who is ready to answer your questions about basement waterproofing and crawl space repair questions. You'll be in full control of the process, selecting the best options as you go. The cost of waterproofing a basement or drying a crawl space will depend on how you customize your system, which can include sump pumps, drainage systems, basement wall products, basement flooring, dehumidifiers, basement windows, crawl space vapor barriers, and many other options. No two jobs are ever the same! What you will not experience is a high-pressure sales tactics or prices that suddenly drop ten to fifty percent over the course of the visit. Our personable, professional representatives know that our products speak for themselves, and they want you to have the best experience possible with our network. One of the greatest things about Superior Basement Systems is that we do it all. From the windows, floors and walls, to the crawl space vapor barrier and our energy-efficient dehumidifiers, you will have experienced and skilled contractors working on your home. In most cases, your basement will be finished in less than two days, and the basement or crawl space area can be used immediately once the job is completed. You'll be surprised by the speed, skill, and flexibility of the team of contractors when they arrive. These are people who work in basements every day, and they understand the special challenges of a basement environment better than anyone. Flooding basements, leaking windows, basement wall cracks, leaking pipe penetrations, poor grading, and leaking plumbing are the kinds of challenges they specialize in. Our service to you does not end the day we're done with the installation. Superior Basement Systems's basement waterproofing contractors will follow up with you to make sure everything went that way you wanted it. If you have any feedback or issues, we want to hear them. And when the time comes to service your system, or if you need alterations, improvements, or warranty work, you've created a business relationship with a stable, established company who's there whenever you need them. Superior Basement Systems would like to help you transform that dark, dingy basement into an extra floor of usable, dependable space in your home. They offer free, no-obligation basement and crawl space quotes and inspections. Call or contact us online today!